Foolish land-born air breathers! Behold the terror from the depths, the tentacled conqueror of humanity: Squid Girl! With your pollution and stuff you really deserve it, so prepare for menacing, inky doom! 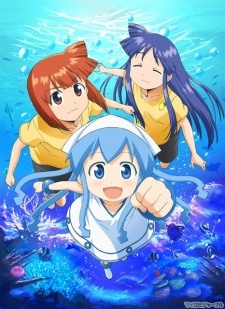 Squid Girl has come from the depths of the sea to conquer humanity for its pollution of the ocean. Within moments of arriving on the surface world, our easily distracted, little invertebrate is promptly bullied into working for the Aizawa sisters as a waitress, supplying their restaurant with squid ink. If poor Squid Girl can't handle two pushy Japanese girls, how will she ever subjugate the human race? The Invader Comes From the Bottom of the Sea!